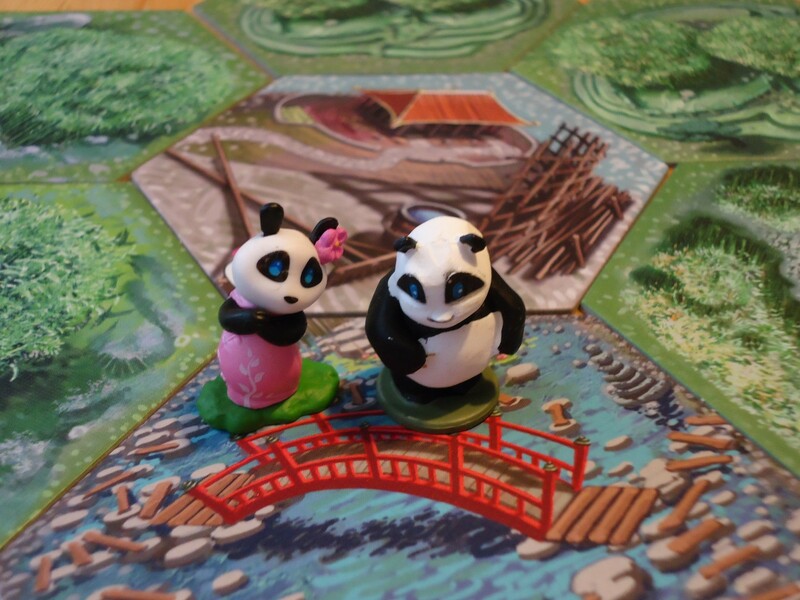 The Emperor of China, in a gesture of peace and goodwill, gave you a male panda to raise in Takenoko. You did such a fine job that now you’re being offered a second panda, and this time you’re getting a female. Your male panda will now have company and lots of it because, well, where there’s a male panda and a female panda, there tend to be some baby pandas. Nine, to be exact, which defies the reproductive odds of panda-kind given that most pandas have only a single offspring at any given time. But hey, this is a board game, not reality, so bring on the babies! All of the rules of the base game remain in effect. The only change during setup is that now you shuffle the new plot tiles and objective cards in with the tiles and cards from the base game. The baby panda tokens and Miss Panda are placed next to the playing area. Miss Panda is not in play at the beginning of the game. She enters the game when a player places one of the new plot tiles with the Miss Panda icon on it. Miss Panda is then immediately placed on that plot. She can only move from one plot to another when a new plot with the Miss Panda icon is added to the bamboo plantation. Other than that, she moves in the same way as the panda. When performing the movement action, you must choose between the panda or Miss Panda. You cannot move both. Miss Panda does not eat bamboo when she lands on a plot. Instead, she may give birth to a baby panda. If she ends her movement on the same plot as the panda, the player who made the move can return a bamboo section of any color to the reserve and take a baby panda token of the same color. This is only possible if the player moved Miss Panda, not the panda. 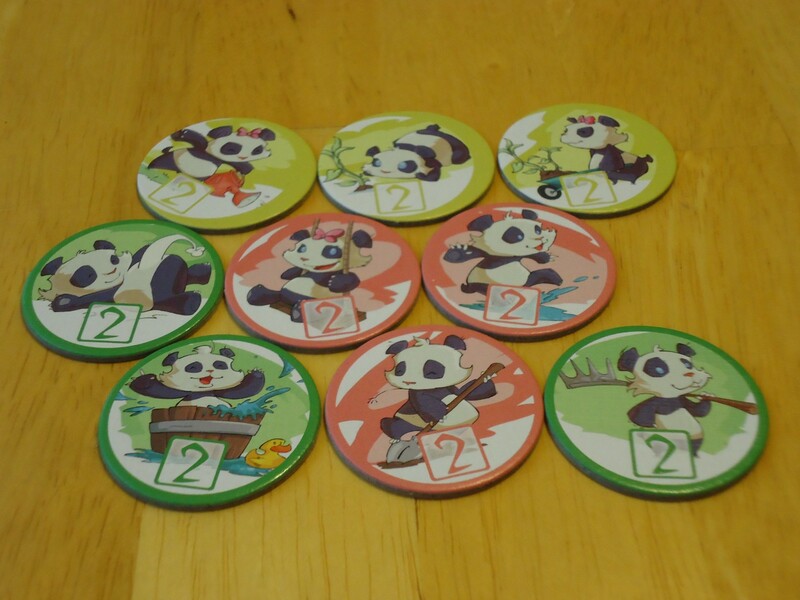 Each panda baby token has a bonus icon on the back for either Irrigation, Improvement, or Objective Changing. When a player gains a baby panda token, the bonus is immediately applied. 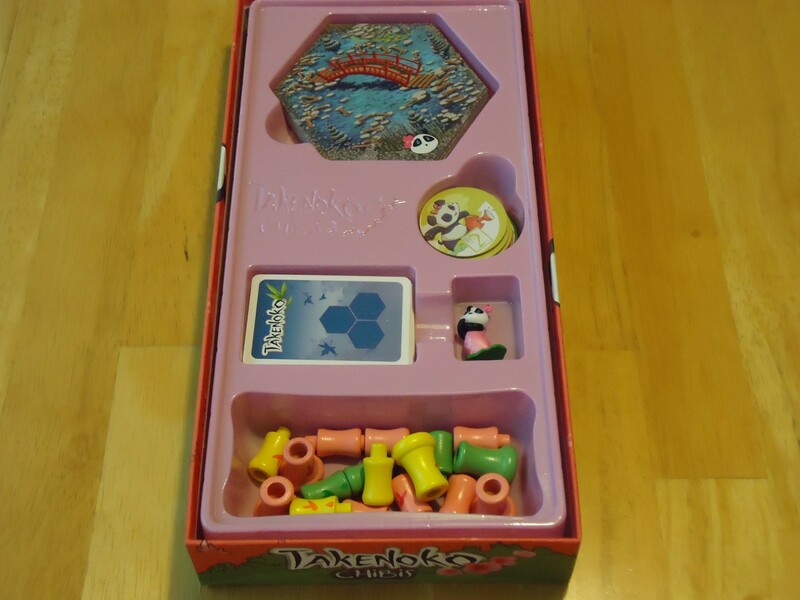 At the end of the game, each panda baby in a player’s possession is worth two victory points. Once all of the baby panda tokens of a given color have been taken, no more panda babies of that color can be made for the rest of the game. Those are the only major rule changes. Beyond these changes, the game adds new objectives and new plots which add some variety to the base game. Love Amongst the Bamboo or War of the Pandas? Is it love at first sight? The backs of the plot tiles are a different shade of grayish-brown. If a Chibis tile is on top of the draw stack an astute player would recognize it, but since you have to draw three tiles, choose one, and then play it immediately, it doesn’t really affect the gameplay. The edges of the cards are grayer than the originals and it’s really noticeable when you have them all stacked together. However, once you get the cards separated into their respective piles it becomes much less noticeable. The backs are a slightly different dye lot than the originals, but this is only noticeable when you place a new card next to a new one. It’s almost impossible to tell which is which in the draw stacks which, again, means almost no impact on gameplay. Finally, the bamboo pieces are a different dye lot than the original (the pink being the most different), but since these are just a supply item there is no impact on gameplay. The good news is that all of the new components easily fit in the base game box without needing to ditch the insert or modify it. Those looking to save shelf space by ditching expansion boxes will have no trouble with Chibis. However, the insert that comes with the expansion is quite nice and worth keeping if you have the space. All the components will fit into the original box, but this insert isn’t bad. This expansion is my favorite kind of expansion: The kind that adds some new twists to the game without increasing the time required, difficulty, or complexity. It is very easy to incorporate Chibis into the base game. Even people who have never played basic Takenoko should have no trouble internalizing the new rules along with the base game rules. Miss Panda is the only element that introduces new rules and these are very simple as her movement is the same as the panda. However, Miss Panda does present some additional choices. If you move her onto the plot with the panda, you can discard bamboo (eaten by the male panda, as Miss Panda does not eat bamboo at all) to have baby pandas. This gives you something else to do with bamboo. The question is, is having the baby the best use of your bamboo? You’ll get two VP’s at the end of the game plus the bonus if you have a baby, but is this enough to justify putting off completing one of your other objectives? It may not be. You may be better off foregoing the baby altogether and keeping your bamboo. You have to evaluate how many points you stand to gain either way, how realistic your chances are of completing your objectives, and how useful one of the baby bonuses might be in moving your objectives forward. However, if you have some random bamboo lying around that’s not helping you in any other way, getting rid of it to have a baby can be a very good option to have. All of this gives players more options and strategic choices than were present in the base game. It still doesn’t achieve the level of depth that some would prefer, but it does remain in keeping with the original game. 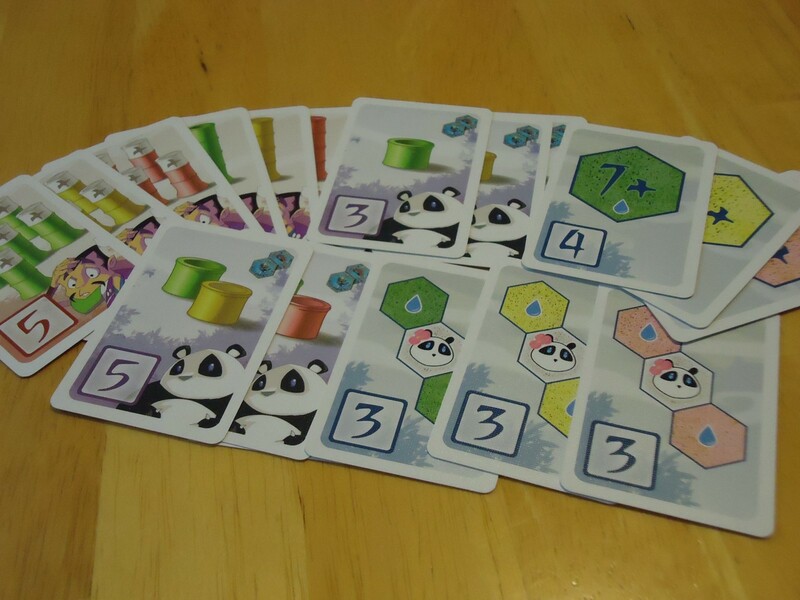 Beyond the female panda and her babies, the new tiles and cards are really “more of the same.” They give you new ways to earn points and new objectives to shoot for, but they don’t differ dramatically from those in the base game. One of the things I like most, though, is that you now have more control over your objectives. In the base game you could draw an objective at any time (as long as you did not exceed five cards in hand), but if you got one that you didn’t like or couldn’t complete you were stuck with it clogging up your hand. Now, however, you have two ways to change objectives. The first is with the new Gardener’s Cabin plot tile. When the gardener lands here, you can draw the top card from each objective deck and choose one to keep. The other two are discarded to the bottom of their respective decks. The second way to modify your objectives is with one of the panda baby token bonuses. Each color baby has one token that allows you discard one objective card from your hand and replace it with the top card from the deck of your choice. There is still no guarantee that you’ll be able to use one of these methods (or that it will help you because you’re still hoping for something good to come out of a random draw), but their presence is a nice change. Another nice touch is the inclusion of two “official” play variants. These can be played whether you are using the expansion or not. The first states that the panda eats only the upper sections of the bamboo and he may not eat the base sections. This can make things just a little more challenging. These second variant states that at the end of the game, each set of different objective categories that you have achieved (plots/panda/gardener) are worth three additional points. This can be a good way of gobbling up some more points if nothing else is working for you. None of this adds any time to the game. Our plays are still clocking in around 40 – 50 minutes, which is what we averaged with the base game. The first couple of times you play will be slower since you have to check the rulebook a bit, but once you get it down the time difference is negligible. Aside from the component issues, my only real negative with Chibis is that the rulebook could be clearer. There are some things which are nebulous and lead to house-ruling. For example, it is not clear whether the baby panda tokens are placed baby face up or face down at the beginning of the game. If you place them baby face up, then the bonuses are hidden, meaning which one you get is random. If you place them baby face down, then the bonuses are visible which provides a little more strategy since you can see what it available and what remains. My group prefers the random option, but I’ve met others who prefer the more strategic choice. It seems to be up to you. There are a couple of places like this in the rulebook. Nothing’s a game breaker, it’s just not as clear as it could be. This was the case for the base game, too, so it wasn’t unexpected. This expansion isn’t likely to make you love Takenoko if you didn’t like it already. Chibis changes very little about how the game is played, its randomness, complexity, or depth. What it does do is give you some more ways to score points and a few new things to think about. (Plus another cute panda figurine and cute babies! Never underestimate increasing the adorableness factor.) If you already enjoy Takenoko, Chibis is a good way to inject some freshness back into the game while still keeping it accessible for families and non-gamers. 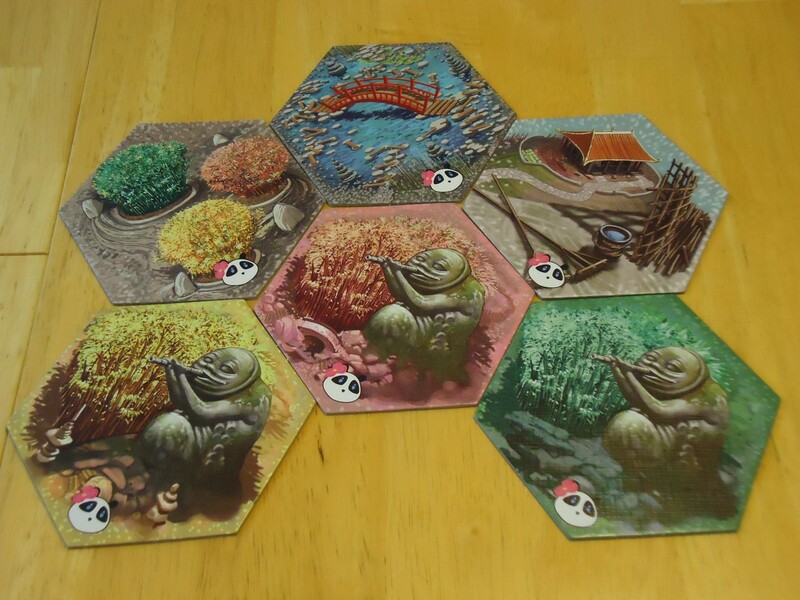 If you hated Takenoko, there’s nothing here that’s going to fix that for you. I really enjoy this expansion and don’t see us playing without it from now on. It’s simple enough to incorporate into the game that we’ll bring it out even with new players. We enjoy Takenoko as a breezy, cute, fun game that is perfect for weeknights or ending a tougher game night. This expansion doesn’t change that feeling. It only adds a few new things to think about and a little more cuteness into the game. In that sense, it’s perfect. 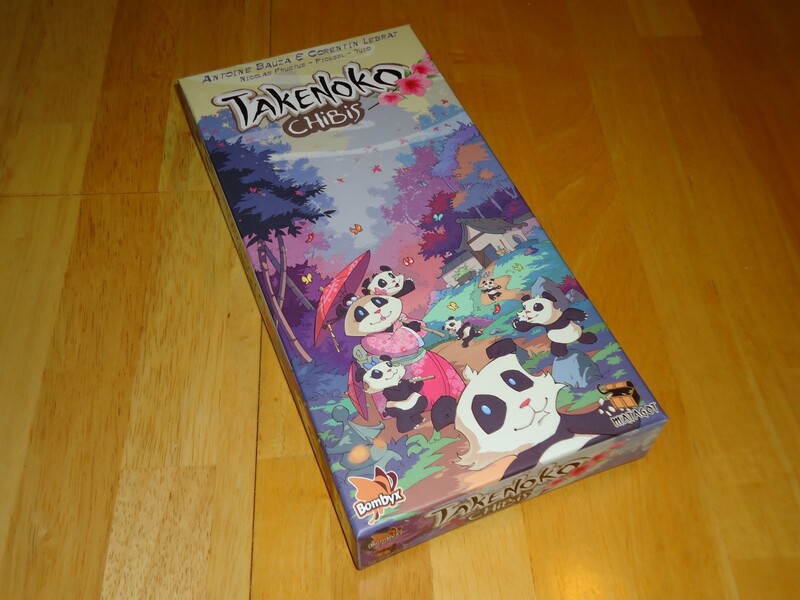 iSlaytheDragon.com would like to thank Asmodee for providing us with a copy of Takenoko: Chibis for review. Very simple to incorporate into the base game, as there aren't a lot of rules to master. All of the components fit in the base game box. Freshens up the base game without significantly changing the base rules, complexity, or time required . Adds a little more to think about when deciding whether to have babies or pursue other objectives. The rule book could be a bit clearer. The components do not perfectly match the original. Those hoping for more depth won't find it here. I like games with tiles/modular boards that set up and play differently each time. I'm also one of "those people" who likes dice and revels in randomness. I ended up putting the tokens face up. I figured since the back of the tokens are unique, it wouldn’t be hard for someone to know which token was which bonus (and I saw on BGG that you can look at them at any time). But I agree, the rulebook is not clear on this one.